I dye multi colored hand dyed fabrics. I want to help quilters understand how to work with all these colors to their best advantage. So I’m doing a series on working with multi colored hand dyed fabric. I have found that I really like working with my Rainbow Stripe fabric, mainly because it gives me so many color options all in one piece of fabric, and also because they blend one color to the next. 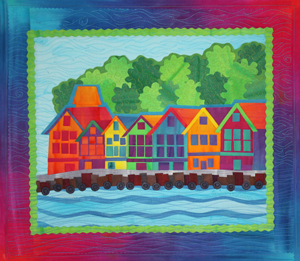 After teaching in Bergen Norway several years ago, I came home and designed this fun little SeaSide Village quilt. If you know Bergen, you know that the downtown area has a row of old wooden buildings on the wharf that are brightly painted. 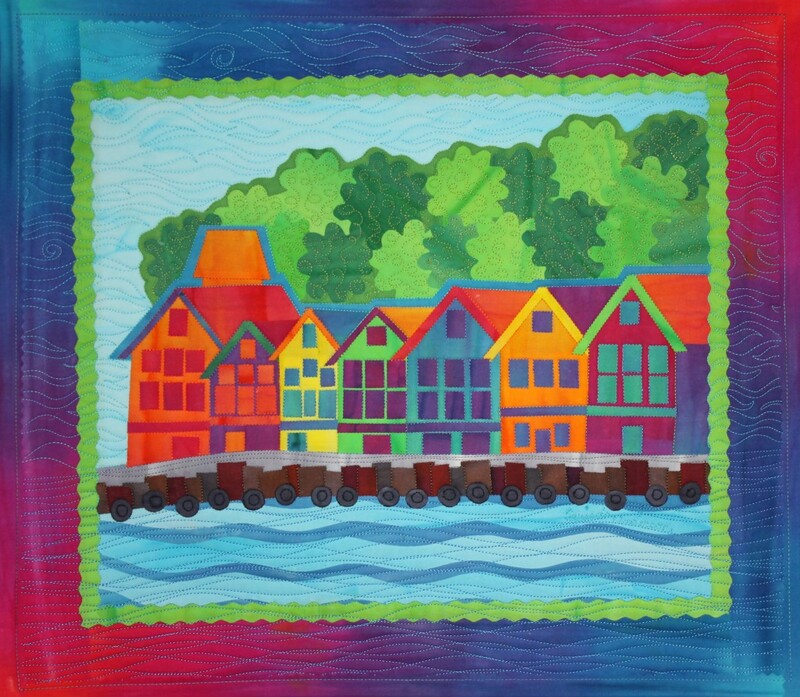 I was inspired to create the houses in this wall quilt from those buildings. I used my Rainbow Stripe fabric to make all the houses and their trim and doors from just a half yard of the Rainbow stripe fabric. I had enough fabric from that same half yard of fabric to also make the outside border. This is of course a completely fused art quilt, so there is no waste or turned under edges. People often tell me how much they like my quilts and I really think it is because of the bright colors that I use. But I also think it is because of the way the colors look, not just SOLID color, but the movement of the color on the fabric. It’s fun to fuse up your fabrics and start cutting away and being creative with color and design. Love this quilt and it does look like Bergen. Your fabric is well worth the price, as every bit can be used and the saturation of color is to dye for!